John Root conducted an Edible Wild Plants Walk at the organic Lindentree Farm in nearby Lincoln yesterday evening and I was there. I learned that that weed, of which I pulled thousands from the old compost heap, is Lamb’s Quarters, that it is absolutely yummy and nutritious and grew itself for free and without my care or attention (but I already knew that). And I ate not a one. They all went into the (new) compost, though, so eventually I’ll eat them, but still. Today I pulled several weeds from the strawberry patch. 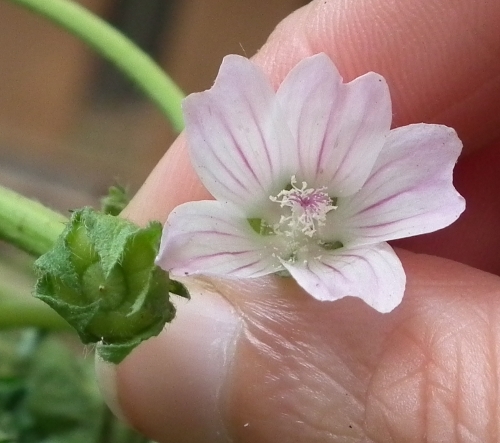 I spent some time with one of them, Botany in a Day, and Amie’s loupe and discovered it is a Mallow, probably Cheese Mallow (Malva rotundifolia). 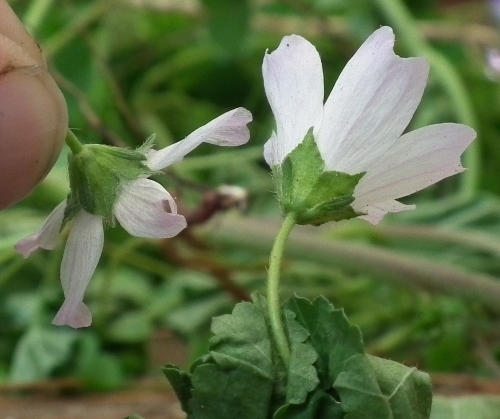 Here’s the distinctive funnel-shaped five-petaled flower with a column of stamens. 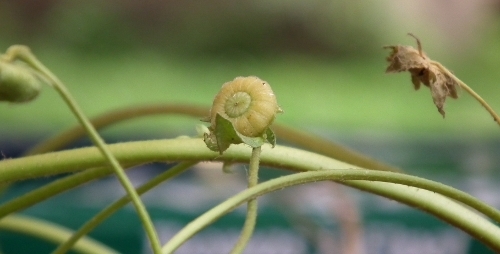 The Mallow is mucilaginous or slimy when crushed and contains pectin. 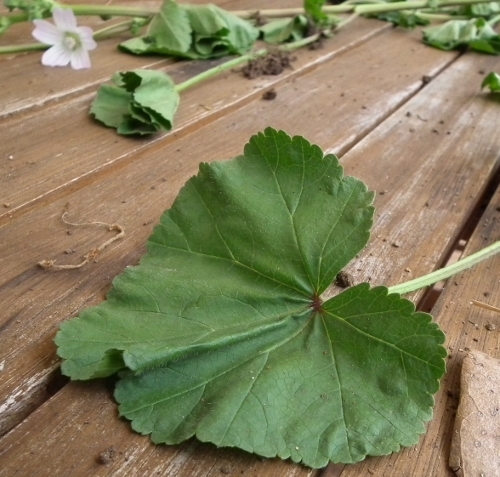 The marshmallow we roast over the fire used to be made from the roots and seeds of the Marshmallow (Althaea officinalis – which comes from Europe and which I purchased and have thriving in my herb garden) and our indigenous Malva can be used to make marshmallow too. Because the Mallows are so slimy, they are a great external emollient and an internal demulcent and expectorant. 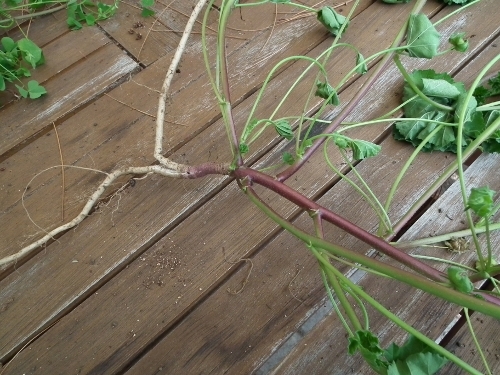 Roots, leaves, flowers and seeds (cheeses) can be eaten and are rich in calcium and iron. To me, this is the best way to learn, to have someone show and explain. If the mallows contain pectin, I wonder if they could be used for jelly making. Hmm. In my cheese making research, I’ve read about certain plants that were used as coagulants instead of rennet. 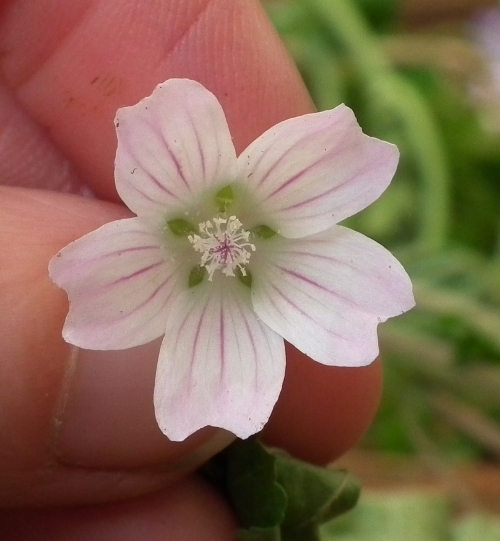 Malva sylvestris is one, Arctuim minus is another. It doesn’t say what kind of mallow or nettles that is, but at least some of these are on my list to grow someday. You should get a poem tomorrow!